NOTE 2 : Number of the scheduled subframe mean that the subframe that is scheduled to transmit data. The throughput calculated in this page is the throughput at the first step of the following process (Refer to Physical Layer Channel : Downlink : PDSCH (Physical Downlink Shared Channel) for the details). Usually throughput calculated at this step is taken as a reference throughput (ideal throughput) because the throughput specified in UE Category represents the throughput at this step. When you say 'Trasport Block Size', it means the size of the array 'a' at the first step of the following process. This throughput often get configured with the throughput calculated at the last step of this process. The throughput at the last step in the process can be defined as physical layer throughput. 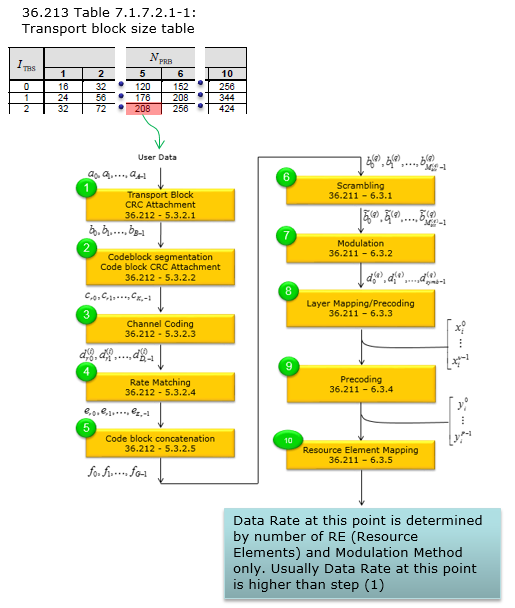 The data rate at this step is determined only by number of REs allocated for the data and the modulation method (QPSK, QAM, 16 QAM etc). In most case (practically every PDSCH), there is some difference in terms of data rate between the first step and the last step. This difference is determined by Code Rate.